Astros' Yuli Gurriel Suspended For Racist Gesture — But Not Until After The World Series : The Two-Way The Astros' first baseman Yu Gurriel will sit out five games next season without pay, and undergo sensitivity training. But the MLB stopped short of excluding him from the rest of the World Series. Yuli Gurriel will be suspended for five games in the 2018 season, and will receive sensitivity training in the off-season. Going into Game 4 of the World Series, the Houston Astros have a 2-1 lead. But a dark cloud is hanging over Houston's Friday night victory after first baseman Yuli Gurriel made a racist gesture toward Japanese LA Dodgers player Yu Darvish, pulling at the corners of his eyes and appearing to say "Chinito," which is translated as "little Chinese boy." Just a few hours before Saturday night's game, Rob Manfred, the commissioner of Major League Baseball, announced that Gurriel would be suspended without pay for the first five games of the 2018 season. He will also be required to undergo sensitivity training during the off-season, and the Astros will donate his lost wages to "charities supporting diversity efforts." "There is no place in our game for the behavior — or any behavior like the behavior we witnessed last night," Manfred said in a press conference. "There is no excuse or explanation that makes that type of behavior acceptable." And yet, the suspension beginning next season means Gurriel is back in the Astros' lineup tonight. Darvish released a statement on Twitter, encouraging his fans to stay positive. "No one is perfect," Darvish wrote. "That includes both you and I. What he had done today isn't right, but I believe we should put our effort into learning rather than to accuse him. If we can take something for this, this is a giant step for mankind. Since we are living in such a wonderful world, let's stay positive and move forward instead of focusing on anger. I'm counting on everyone's big love." 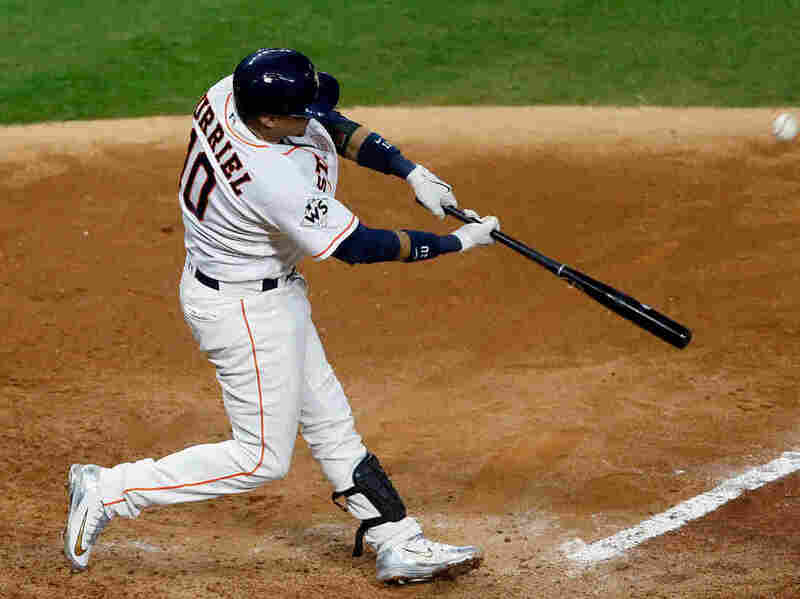 The Astros have never won a World Series, and Brien Straw of Houston Public Media told NPR's Michel Martin, baseball has been an important morale booster in the wake of Hurricane Harvey. "The World Series without question has provided the relief this city has needed," Straw says. "That there's this diversion, and it's honestly such a thrilling diversion that a team is in the World Series — is something that's really nice." After last night, however, Straw says some Houston fans are feeling conflicted.